I am not a vegetarian. My partner is though… which basically makes me a vegetarian. However, my partner is not one of those vegetarians that does not like meat. She’s an ethical vegetarian; which means while she doesn’t agree with how the food reaches the plate, she sure likes the taste of some of it. 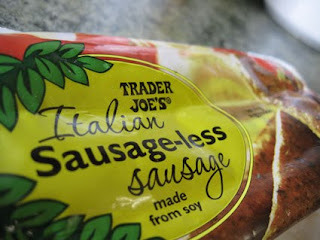 Which is how why we came to discover the taste sensation that is Trader Joe’s Sausageless Sausage! Now, without wanting to sound like a commercial, this product is seriously great. Coming from England, I have high standards when it comes to bangers. Previous to our discovery we had tried various other brands of veggie sausage; most of which, at least to me, tasted like rubbish. However, with the sausageless sausage, they have nailed the texture and flavors. It does not taste exactly like it’s pork cousin, as fake meat never does, but the ingredients they use give it a warm and herby feeling; not unlike the stuffing you eat at Christmas time. What’s more, the reduced cooking time and firmer consistency make it super versatile. We eat it for breakfast and in pasta, stir-frys, salads and sandwiches. In terms of it’s nutritional value, it’s not bad either. It has a fairly high sodium content (which no doubt explains why it tastes so good) and contains some saturated fats, but being made from soy it is full of protein and even has some fiber. 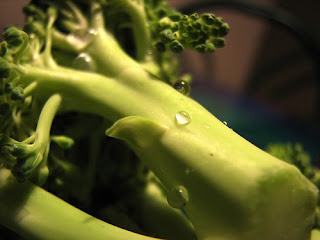 So if you’re a vegetarian, vegan or even a meat eater looking for a healthier option, I would recommend you give these little links of love a try… and thank me later!